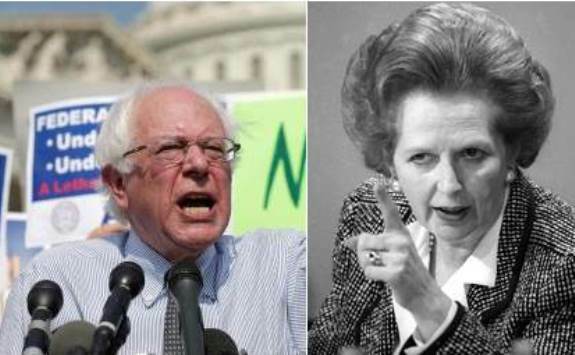 As Margaret Thatcher, Prime Minister of Great Britain famously pointed out, "socialism works great until you run out of other people's money." One has to look no further than the resonating presidential campaign of Bernie Sanders, particularly with the youth of America, to validate the widely held belief that the state of education in the United States is abysmal--not only in the inner cities but at the esteemed ivy laden institutions as well. At least as it seemingly pertains to history, math and economics. Last time I checked the history books, the largest, and while it lasted most successful(key word: lasted) experiment in the history of the world with socialist politics flamed out in utter and abject failure. I get that twenty somethings might not know of the American hockey win at the Lake Placid Olympics in 1980, but are things so placid in America's classrooms that the Soviet Union, the loser in that famous game as well as the game of ideas, doesn't ring a bell. Kids born after 1990, please know that just because something didn't happen in your lifetime doesn't mean it didn't happen. Once upon a time there were just three TV channels to watch, starting at age eight the only rule in summer was to be home for dinner, you didn't get trophies for participating (you had to win and you were disappointed when you didn't which made you try harder), there was a Cold War instead of Coldplay, flights to the moon were calculated on a slide rule (something that looked like a ruler and moon walks were real too) and the Soviet Union wasn't in a galaxy far, far away. I hate being the bearer of bad news but regardless of what Bernie tells you, and I know he is very lovable (heck, I'd love to have lunch with him and I'll even pay), there is no free lunch. Yes, it is true, there is no free lunch. The math is the math. Fortunately, it is simple addition and multiplication (just with lots of zeros), which I believe is still taught in America schools, in spite of the citizenry's desire to ignore the consequences of ignoring the math. Believe it or not, things have to be paid for, regardless of whether you believe something is a privilege or a right. Furthermore, no matter how much you tax the rich, not even they have enough money to pay for all of Bernie's promises. Kids, I know you haven't been trained to deal with disappointment (see participation trophy) so I'll let you deal with this horror for a moment before I move on. I know you might still be shaking but here is a thought experiment to consider. You could confiscate the entire wealth of America's richest 400 hundred people and it amounts to roughly $1.5 trillion. A lot of money until you want to redistribute it to millions of people. For instance, if all that wealth was invested in 30-year U.S treasury bonds the annual income (income is the way you pay for stuff) amounts to roughly $40 billion per year. This is roughly enough money to cover about half the current cost of paying for America's prisons or 2% of the total national healthcare bill or about 1% of the annual federal budget. This is really, really important so please absorb what this means. 1% of something, of anything, is on the margins and the cost of Bernie's promises are not on the margins. Net, net, contrary to what Bernie promises, taking from the rich as he so proudly and enthusiastically advocates, it barely moves the needle when it comes for paying for stuff for the other 99%. While Bernie wants to demonize just about anyone with two nickels to rub together and mostly those who work on Wall Street, truth is what just about everyone could agree to--democrats, republicans and socialists alike--it is ok and achievable for the top 99% to pay for the bottom 1%. Unfortunately, regardless of what may or may not to be fair (a very subjective concept), any objective and honest evaluation of the math will instruct you that it is absolutely impossible for even the richest 10% to pay for all of Bernie's promises and still afford to pay for their own lunch. Side note, taxing people to the point where they can't pay for their own lunch is not a good thing, period. What may sound great in a speech and get people excited, particularly young people that don't apparently have the benefit of a lesson that explores the historical outcomes for countries organized around the principles of socialism, what Bernie advocates simply doesn't work. As Margaret Thatcher, an important historical figure from the 20th century (you can look her up on Wikipedia), famously pointed out, "socialism works great until you run out of other people's money." In thinking about the rise of Bernie, the word ignorance comes to mind which none other than the venerable Merriam Webster dictionary provides the following example for use in a sentence: "with such vast sums spent on education, the level of ignorance among graduating seniors is a national disgrace." Seems the dictionary was rather prescient in how the abysmal state of education in this country has given way to making proven failure fashionable. Time to get enlightened America.